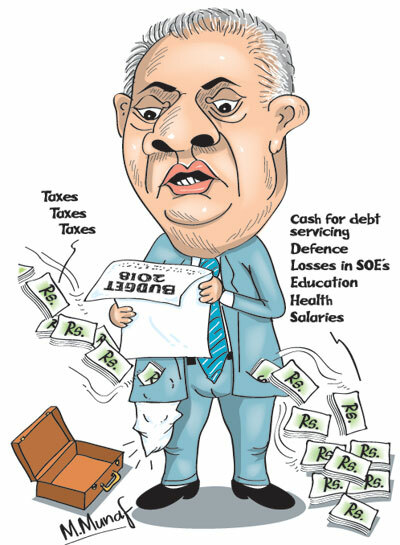 The overriding objective of the 2018 budget should be to achieve a reduced fiscal deficit, while enhancing revenue, increasing expenditure on social and economic infrastructure and reducing wasteful expenditure. The prospect of achieving the fiscal deficit target should not be hijacked by politically motivated increased expenditure in the coming election year. It is vital that the 2018 budget and its implementation achieves the targeted fiscal deficit of 4.6 percent of GDP by increased revenue that would enable increased developmental expenditure, especially increased expenditure on education and health services. There are prospects of achieving this owing to the government’s understanding of the importance of reducing the fiscal deficit, the new Inland Revenue Act that has provisions to improve tax revenue, the progress in achieving a lower fiscal deficit of 5.4 percent of GDP in 2016 and the continuation of this declining trend in reducing the deficit so far this year. On the other hand, there are concerns of fiscal slippages owing to the approaching local government and provincial government elections early next year. As in the past, the government could increase expenditures and reduce taxes that make it popular and thereby undermine fiscal discipline. Furthermore, there has been little progress on reforms in state enterprises that incur huge losses. Large uneconomic state expenditure too continue. The efficacy of the new Inland Revenue Act in enhancing revenue would depend on the administrative capacity and integrity of the tax administration. While provisions of the new Inland Revenue law eliminating tax exemptions and its increased tax rates would increase revenue, the vital breakthrough in tax revenue collection would come with the reduction of tax evasion and tax avoidance. It is doubtful that this could be achieved especially in the short term. Most discussions of the Budget are likely to deal with the taxes imposed and benefits given by the Budget. The more significant issue of fiscal consolidation discussed here is neither understood, nor the concern of most. It is not likely to be the focus of popular discussion. And yet much of the country’s economic stability and growth hinges on achieving a lower fiscal deficit. In as much as this column has repeatedly stressed the need for fiscal consolidation for economic stability and growth, the annual State of the Economy reports of the Institute of Policy Studies have repeatedly underscored the need for fiscal consolidation. The State of the Economy 2017 report of the Institute of Policy Studies of Sri Lanka (IPS), once again emphasizes the critical need for fiscal consolidation by broadening the tax base and rationalising spending and improving efficiency. It points out that sound fiscal policy is a priority for macroeconomic stability and that such stability is in turn a fundamental prerequisite for sustained growth. The State of the Economy 2017 points out that many of the difficulties in achieving higher economic growth stem from weak public finance management that constrains investment and productivity in the economy. The report focuses on measures to improve public finance management and chapters related to promoting exports and Foreign Direct Investment (FDI), improving labour market performance, advancing the education system through innovative funding, mobilising resources for health care financing, improving resource efficiency for poverty reduction initiatives, financing urbanisation, sustainable development with environmental fiscal reforms, and economic incentives in financing agricultural investments are related to and dependent on proper fiscal management. The report also argues that when reforms reinforce each other through a careful calibration of taxes and expenditure to harness growth and improve economic outcomes across key policy areas, they are likely to enhance the effectiveness of fiscal consolidation efforts. The critical need for fiscal consolidation discussed above is not easily comprehended. A low fiscal deficit is vital for economic stability and sustained economic growth as large fiscal deficits debilitate the economy in diverse ways. Containing the fiscal deficit, reducing the public debt burden and decreasing debt servicing costs are vital for economic stabilisation and long term economic development. Large fiscal deficits lead to borrowing and in turn to huge debt servicing costs that distort public expenditure priorities, generate inflationary pressures and hamper economic development. Inflationary pressures increase the costs of production and erode the country’s competitiveness in international markets. A large public debt therefore has a serious destabilisation effect. Containing the fiscal deficit to 4.6 percent of GDP in 2017 and reducing it further to 3.5 percent in 2020 is vital to achieve economic stability and growth, prevent the public debt from escalating to an unsustainable level and impeding economic growth. Successive governments have found it difficult to contain the fiscal deficit to the announced targets. It is to the credit of this government that after a mishandling of the public finances in 2015, it has made progress in bringing down the deficit in 2016 and this year. There is every prospect of achieving the fiscal target of 4.6 percent of GDP in 2018 owing to the political will of the government and the revenue enhancing new Inland Revenue Act. However it is vital that the government remains vigilant to ensure that government expenditure is not increased owing to the political pressures of the elections next year. If government expenditures increase in any particular area, then there should be a curtailment of other expenditure to ensure that total expenditure remains as planned. The stability and growth of the economy rests very much with the attainment of fiscal consolidation in the Budget of 2018. It is vital that the 2018 budget to be presented to parliament on November 9 and its implementation achieves the targeted fiscal deficit of 4.6 percent of GDP by increased revenue that would enable increased developmental expenditure, especially increased expenditure on education and health services.